Is this why people collect human remains? Lately I have been on a art-crime reading kick. Nothing fancy, just popular non-fiction about art theft in my lighter or lazy moments. Such reading makes me feel like I am working (even though I am not) and gives me various things to think about. Last night I was reading about what seems to be the constant (and often successful) push for versions of Edvard Munch’s The Scream to tumble into the stolen art abyss. Everyone seems to be stealing The Scream all the time. Dare I say it calls out for theft? I dare! I keep thinking about the next step in such art thefts and I guess that is the greatest mystery of them all: how can anyone possibly sell off The Scream? Who buys that?! This, of course, is where the “Dr No”, directed theft for a secret private collector idea comes in. I know, I know, people like that can’t possibly exist: they are the stuff of novels and kind of crappy films. Yet, if I evaluate prominent art theft on a work by work basis, I imagine that The Scream has just the right tone and mystique to appeal to those master criminals of infinite resource out there. The Scream is the kind of piece desired by those who don’t plan on sharing their art collection. It is internal….private. It is an angsty piece for your solitary, self-serving billionaire. I have to admit, I’ve never really liked The Scream. Munch just isn’t quite what I am looking for. There is something enchanting about his quite edgy 1894/95 Madonna (stolen along with The Scream in 2004), but I think my experience of emotion just does not match Munch’s (probably for the best, yeah?). Yet I was instantly interested when I read that there is some evidence that the main figure in The Scream was inspired by Munch’s viewing of a Peruvian mummy. “Oh! Yes!” said I.
Gauguin’s “Where do we come from? What are we? Where are we going?” (Which is in the MFA? I should go look I suppose) has a possible Peruvian Mummy-inspired figure too. Gauguin felt that this painting should be read right to left and the mummy figure is the left-most (last) figure: to quote Gauguin “an old woman approaching death appears reconciled and resigned to her thoughts”. The artist vowed to commit suicide after the completion of this painting (his masterwork) but he stuck it out for a few more years, dying in 1903 of a syphilis, alcohol, morphine overdose triple threat. Well, maybe I do have a bit of an idea. I sort of see two strains at work here. The more obvious is the sort of call of the non-Western in the emerging art movements of the late 19th and early 20th century. We all know antiquities and non-Western cultures played their part: your Cycladic figurines and African masks in Picasso… the moment that Matisse realized that Polynesian folks are awesome. Yet I always thought this was a bit cringe-worthy: placing a Western veneer on something else to make it palatable. In 2005, in an exhibit at the Cambridge Museum of Archaeology and Anthropology, I saw a Maori cape made out of Cambridge scarves. It felt like something that needed to be said. The second strain is our pan-human curiosity about death. Mummies are death defiers. By simply still existing, they violate the rules of human existence and, thus, seem to hold some sort of secret about the human condition. Skin retracts when it desiccates (is that a word? 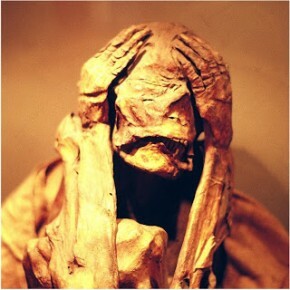 ), mummies tend to look like they are screaming (see a whole archaeology.org article on the topic of screaming mummies), various ancient Peruvians made mummy bundles that often had hands near faces, and BAM you have a dead body that knows the great unknowns of human existence and seems to be horrified by the enlightenment. In a previous blog entry, I expressed some shock that people actually collect South American mummies. Yet, now that I think about it, perhaps that is not so shocking. If these bodies meant so much to Matisse and Munch that they based the focal points of their masterworks on them, someone else is going to see that. Chalk this blog entry up to trying to understand.